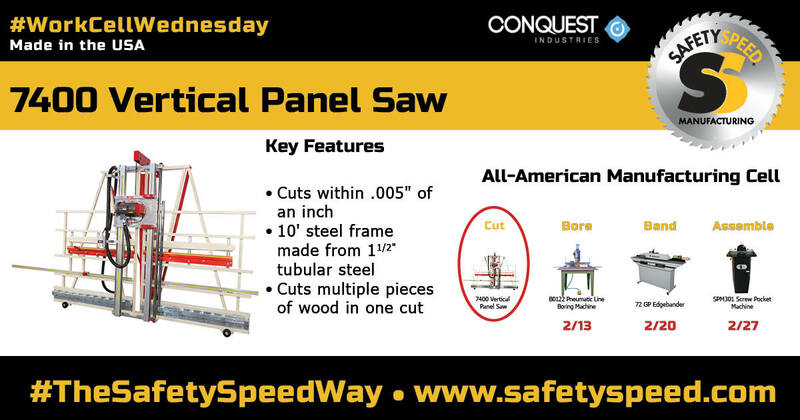 Since the inception of the first Vertical Panel Saw created in 1958 by Safety Speed founder Gene Olson, it’s no coincidence our Vertical Panel Saws are now produced with cut tolerances of .005 of an inch, straight and square. The 7400 Vertical Panel Saw is the first step of the All-American Work Cell and our first Work Cell Wednesday product showcase. Engineered with high volume woodworkers in mind, it cuts multiple pieces of wood in just one cut. Frame: Constructed with a 10’ welded steel frame made from 1 ½” tubular steel. The cut out frame design allows for SawGear and TigerStop systems to be added. Material Rollers: Contains 22 material rollers, preassembled on the same track. Having 22 material rollers provides better material support, easier manipulation of panels and greater stability. Vertical Movement: Uses dual V-track bearings on vertical beams allowing for a very precise guide system allowing it to achieve a tighter tolerance. Durability: 2 or 3 HP with 1 or 3 phase continuous duty induction saw motor allows for continuous use all day, every day. The rugged design allows it to withstand different operators with different techniques. With high volume woodworkers in mind, the 7400 Panel Saw is designed to cut multiple sheets of stock in just one cut. Watch this short video highlighting the 7400! Please fill out the following information. Someone from the shop in Minnesota will contact you shortly.